Keep parks and outdoor areas free of litter with the Sentinel double 34 gallon litter receptacle. Featuring a side door for easy maintenance and heavy duty lockable latch with provision for customer supplied pad lock. Commercial grade construction with two 1/4" x 2" flat steel bar hoops and a 1-5/16" O.D. steel tube supporting the 3/8" x 1" vertical steel bars. An additional 1/4" x 2-1/2" base ring with horizontal slats at the bottom keep liner off the ground. Two 34 gallon liners included. This litter receptacle requires two lids. 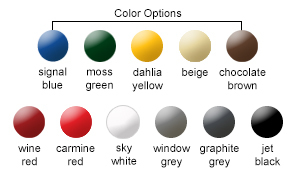 The flat lid, rain shield lid, weather shield lid and ash urn weather shield lid are offered in polyester powder-coated finish, color options as shown. 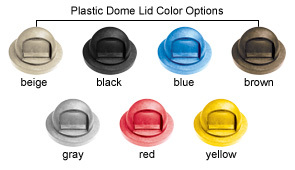 Plastic dome top lids are available in the colors shown. 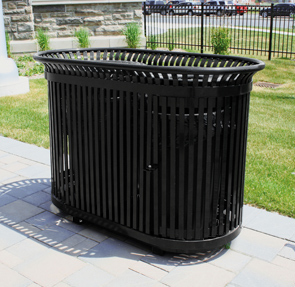 These litter receptacles are available with several versatile options designed to suit your needs. To make your ordering process simple please follow the easy 3 step ordering process. Select Model (A) and Choose trash can color.